From what I hear from readers these days, a lot of people out there are compulsively clicking the “refresh” button, living in fear of the next 500+-point drop in the Dow. But is now the time to actually start panicking? We’re going to dive into that question today. I’ll also reveal 1 fund that protects your nest egg with a unique form of “insurance” while handing you a huge 7.5% cash payout. The market wipeout has had one extra element that’s added even more terror: dire warnings from the semiconductor industry, which sent Advanced Micro Devices (AMD), Texas Instruments (TXN) and Nvidia (NVDA) into free-fall and badly beat up the benchmark VanEck Vectors Semiconductor ETF (SMH). 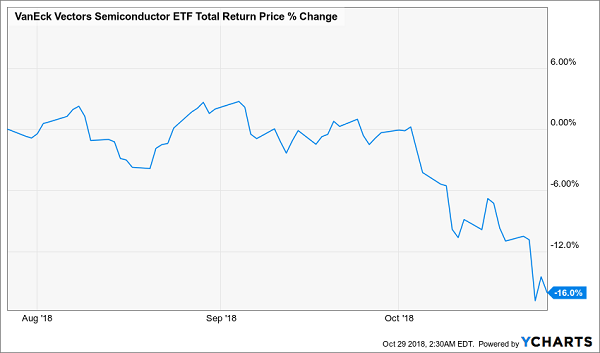 True to form, CNBC responded with an article titled “Here’s why the slump in semiconductor stocks may be a sign the US economy is slowing down.” The reason? Because 28% of non-residential fixed investment goes into IT equipment and software, or so says Moody’s Analytics chief economist Mark Zandi. While this is true, you can only tie a fraction of that 28% to semiconductors. The lion’s share goes to computers, software and IT infrastructure. 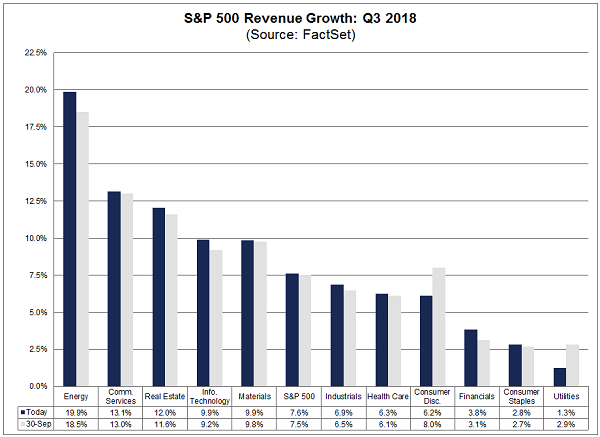 And since semiconductor prices have been falling since, well, semiconductors were invented, it’s not surprising to see them take a backseat to other tech spending. But that isn’t the biggest reason why Zandi is wrong. There’s a lot of other data to show that the semiconductor earnings problem is just that: a semiconductor problem. When you look elsewhere, things still look very good. Let’s start with the overall growth numbers. Last Friday, the Commerce Department reported that US GDP rose 3.5% annualized in the third quarter, above the 3.3% economists expected. While that isn’t as high as the second quarter’s 4.1%, it does mean 2018’s GDP growth is set to be over 3% if the trend continues into the fourth quarter, which more economists now expect. That isn’t even the most exciting news. Because many mainstream outlets ignore a crucial figure: GDP growth per capita. This is a true sign that individual Americans are getting richer. (After all, you can grow overall GDP just by doubling the population with everyone making the same amount of money). … and They Are Spending! What’s truly amazing here is that sales are up even though the US dollar has been stronger against foreign currencies, which lowers sales per share of exported goods. But no matter, the US consumer is strong enough to take up that slack—and then some. These numbers have also beaten expectations—59% of companies have reported revenue above expectations. But are those sales beats translating into stronger earnings? 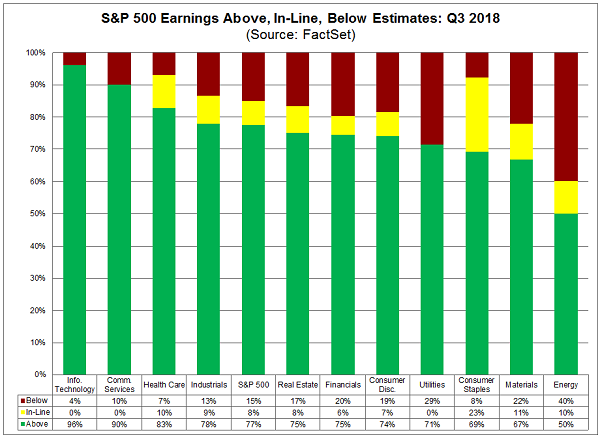 So far, 77% of the companies that have reported have seen Q3 earnings above estimates. In the tech sector it’s actually 96% of companies—a fact that flies in the face of the semiconductor hysteria. This strong profit growth combined with the recent share-price declines has also made the S&P 500’s P/E ratio fall to 15.5, its lowest point in over a year. There is only one thing that could crimp sales and earnings: inflation, which could force the Fed to hit the gas on rate hikes. That’s a fear you hear a lot these days. But the truth is, inflation is stuck: the personal consumption expenditure (PCE) price index, the metric the Fed watches like a hawk, showed 1.6% price growth in the third quarter, far below the 2.2% economists expected. The Fed has said it’s targeting 2% inflation over the long term, and anything below 2% would suggest it has more time to raise rates, meaning it’s highly unlikely we’ll see higher rates coming at a faster-than-expected pace. 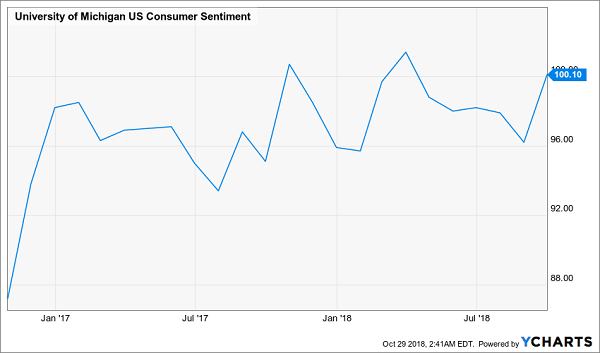 So the question becomes: if we don’t need to fear weaker earnings, poorer American consumers, lower sales or higher inflation, what, exactly, do we have to worry about? An easy way to buy into this market is to get the S&P 500 SPDR ETF (SPY) and hold until stocks recover. This strategy will likely hand you double-digit gains in just a few months. But if you’re an income investor, you might want to consider the Nuveen S&P 500 Dynamic Overwrite Fund (SPXX) instead. 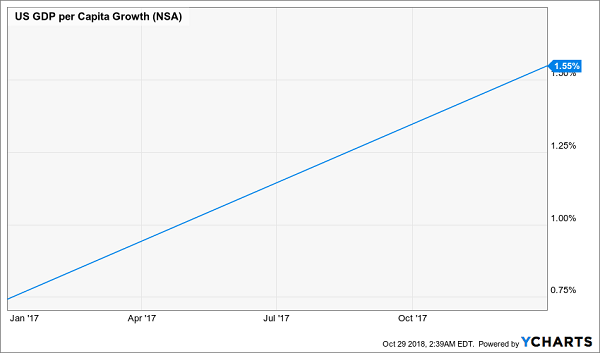 Not only does this fund match SPY in its holdings (as its name implies, it buys S&P 500 stocks), it also offers that nest egg “insurance” I mentioned before, while producing a 7.4% income stream. SPY holders, meanwhile, are stuck with a measly 1.9% yield. How does SPXX protect your investment? In addition to holding all the S&P 500 stocks, it sells call options against the index, meaning it takes advantage of derivatives to increase the income it earns so you get a higher yield while having no more risk than owning the index outright. 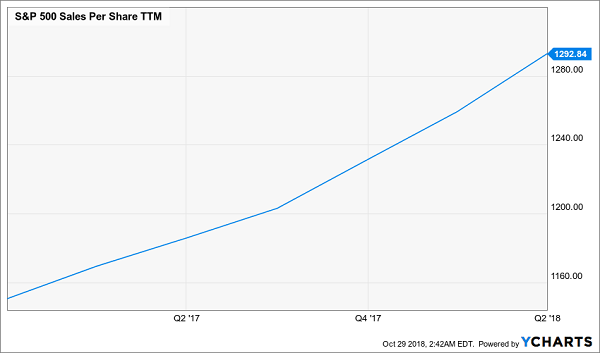 This has resulted in similar returns and a higher yield for years, giving income investors the dividends they crave alongside their capital gains. Investments that hold their own in a crash—to keep your nest egg safe while you collect your outsized cash payouts! Because this is the exact same strategy I use to protect and grow my own investments in times like these. And you know me: I’ve got 5 funds to help you do just that. These 5 funds boast massive (and safe) 8%+ dividends, plus they all trade at absurd discounts to their “true” value. In fact, these discounts are so ridiculous that I expect each of these 5 to simply trade flat next time the market falls on its face! Plus, those huge markdowns set us up for market-crushing gains when stocks ignite. Either way we’ll collect their outsized 8%+ cash dividends in peace, happy in the knowledge that our nest egg is protected. And with the next market wobble likely only days away, you’ll want to move at least some of your hard-earned cash into these proven “lifeboats” now. I just released the full story on these 5 “pullback-proof” dividends, and I can’t wait to show them to you. Just click here and get ALL my research now: names, tickers and my complete analysis of all 5 of these funds—everything you need to know before you buy.